There are many different types of problems. We often forget that and treat all problems in the same way. The problem with equal treatment for all problems is that each type of problem requires a different approach and process. In addition, some problems will never really be solved so setting a goal of solving the problem with a singular solution will only frustrate you and anyone who is trying to help. The type of problem most of us are familiar with are like puzzles. These may be complicated. Some are really, really, complicated – like rebuilding a car engine – while others can be genuinely simple puzzles like – how do I turn on the printer? 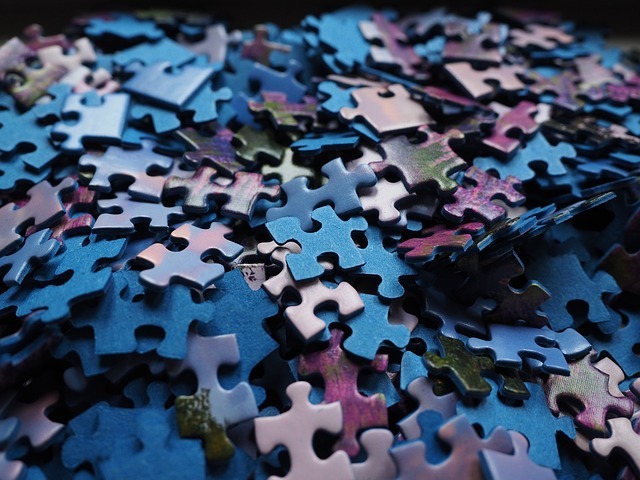 With puzzles, regardless of the number of pieces or variables, there is both a clear cause and effect and a solution that will work over and over again, providing the circumstances remain the same. Sometimes this kind of problem is called an either/or problem. We know there is a solution and it will be either this, or that, or that, or that. The number of thats can be large but the defining point is that you have a “that”. Some puzzles are easy enough to solve by an individual or small group. For more complicated puzzles you can bring in experts or lots of people with local knowledge and use trial and error, waterfalls, chunking, brainstorming and other basic problem solving strategies to solve the problem, or series of problems, at hand. Best or at least good practices are the result of solving puzzles. We do this pretty well and there is a sense of accomplishment when we find that perfect solution. Hey mom, I finished the puzzle! At the other end of the problem spectrum we have complexities or wicked problems, as originally defined by Horst Rittel and Melvin Webber. These are problem that are so complex that in order to even understand the problem well enough to frame the question, you need to solve the problem… but in solving the problem, you create more problems. Wicked problems don’t have a clear cause and effect relationship so it’s impossible to find clear solutions. Wicked problems may be further complexified by disparate values and worldviews. These are problems that never really get solved; rather we run out of time or dollars, chase our tails, or just give up. These are ongoing problems that manifest in unique patterns so best or even good practices won’t work. What we end up are situational solutions that work in one instance and/or only for a short time. Dave Snowden suggests we can navigate through complexities using small, safe to fail experiments called probes. The key is to learn from these experiments so you don’t fall into the trap of repeating the same failed experiment over and over again. He uses raising children as an excellent example of a complexity. With complexities and wicked problems, know that you are dealing with complex, organic, interdependent, connected systems and that any movement will eventually cause ripples or waves. Poverty, illiteracy, global warming, homelessness, violence, and addiction are wicked problems that occur at a global scale. Individuals and organizations are probably not going to solve the major complexities of our time, at least not on their own. Some believe that collective intelligence and big data may hold the key to making big dents in wicked problems. We can learn to navigate through wicked problems better. Learning to navigate is best accomplished with large and diverse groups of people who have committed to cooperate. Successful navigation through wicked problems affecting us globally can only be accomplished through world communities working together. What we can do at the individual and organizational level is to manage the symptoms or indicators associated with wicked problems. To do that, we need to be able to identify and manage the associated dilemmas. Behind every wicked or complex problem you will find multiple dilemmas also known as paradoxes or polarities. Dilemmas are problems that have two interdependent and known solutions. Dilemmas can seem like wicked problems because they also occur in complex adaptive systems and like wicked problems there is no definitive solution. What makes a dilemma different is that there are known solutions that can be managed well and in that management they can be (re)solved… or at least held steady. Dilemmas are still tricky though; when you apply one solution the alternative solution becomes more of a problem. The act of breathing, while it seems pretty simple, is a dilemma that we all manage pretty well. We manage polarities with relative ease, 24 hours a day and seven days a week. On an individual level we manage all kinds of polarities as we try to solve the problem of having a life worth living, being happy, and achieving fulfillment. We manage polarities like home/work, partner/kids, salad/cheese burger, inhale/exhale throughout our lives. Through trial and error most of us of learn that attempting to maintain one of these solutions to the exclusion of the other, over time, results in more problems. 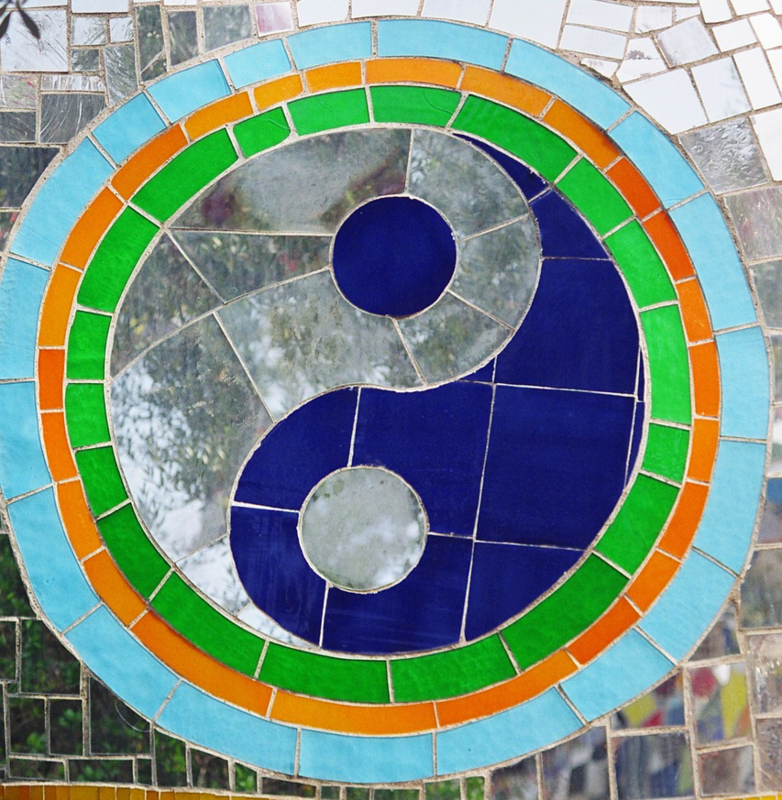 You can also use polarity mapping to manage some of life’s more challenging dilemmas. 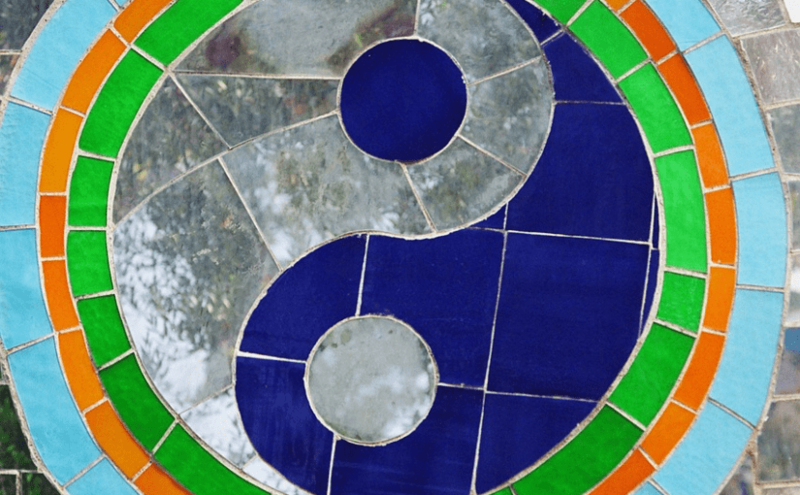 Polarity mapping is a great tool for individuals but its real strength is in helping larger groups explore, understand and manage wider reaching polarities. Polarity mapping is a way of seeing and exploring dilemmas at scale. The mapping process allows a group to name their highest values and deepest fears. Fear drives polarized thinking. We allow ourselves to become polarized or in deep opposition to something when we fear losing that something, that we value. Polarity mapping works across all sectors and levels (personal, organizational, sectoral, societal) and most importantly it allows us to reframe conflict into sustainable innovation and engagement. Polarity mapping is best accomplished by diverse groups of people. Bring people into the mapping processes that have a variety of perspectives and opinions about the issue at hand. 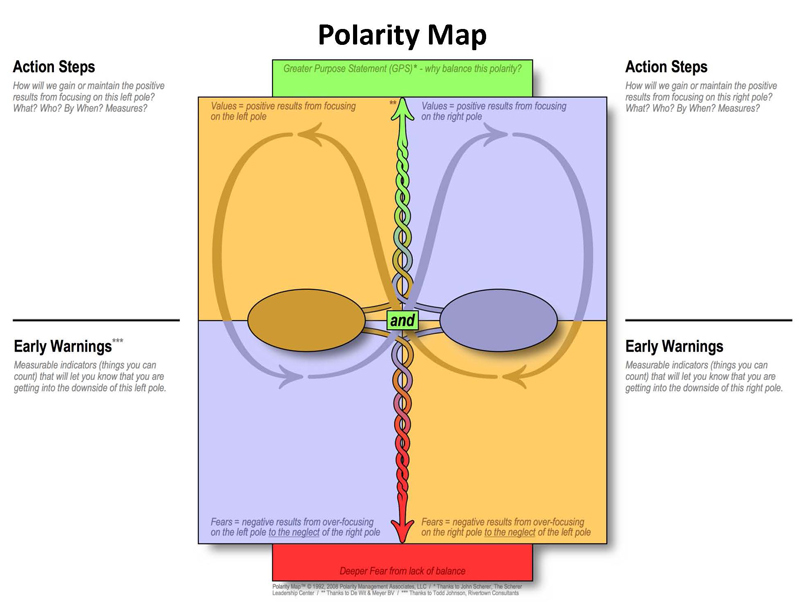 With more complicated dilemmas a polarity map can help define the poles and the process of managing them. Step 1 – Gather a diverse group invested in and committed to exploring the issue. Encourage them to share their perspective or tell their story regarding the issue. Story circles work well for this. You can do this face-to-face or online. Leadership’s role in this is to facilitate the process and hold the space as conveners. Step 2 – Determine if the issue really is a dilemma or paradox to managed using polarity mapping. Do this a group. Step 3 – Create an empty Polarity Map. This is a flip-chart paper and marker activity (or post-it) or for those who bend well, a floor with masking tape and cards works great. Write the name of the issue or dilemma to help avoid drift. Step 4 – Describe the dilemma using the Polarity Mapping tool. Start with the fears – what we don’t want. Dig to get at the real and agreed upon wording of the fear. Ask the group to describe the situation they want to avoid. Record this at the bottom centre of the map. Next describe what they do want – the agreed upon vision of the ideal situation. Record this at the centre, top of the map. In the bottom left box list the downside of the solution named in that pole. In the top left box list the upside of the solution named in that pole. In the bottom right box list the downside of the solution named in that pole. In the top right box list the upside of the solution named in that pole. Step 5 – This is where the management begins. 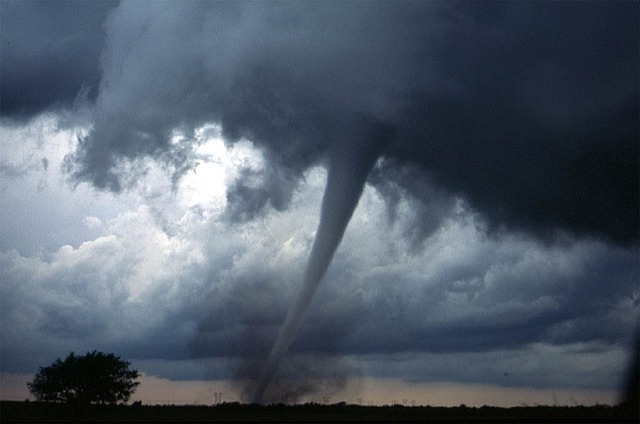 Looking at the list of negatives for each pole and determine and record the warning signs – red flags – that could alert you of movement towards this “Vicious Cycle”. Be specific and detailed. Who will look for these? Is there an early warning system in place? What will we do if we fine ourselves slipping into this area of the map? Step 6 – Look at the lists of positives for each pole and list the specific actions that could be taken to get to, or remain in, the “Virtuous Cycle” at the top of the map. Being specific is the key to this. Who, what, when, where, and how will we support and measure these green flags? 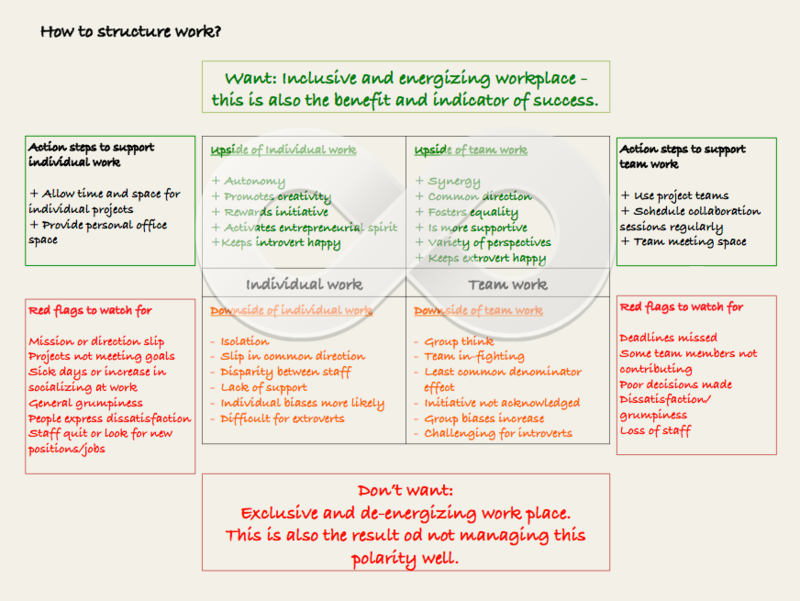 In this example the issue could be called – How to structure work? Again, notice that the outcomes listed as negatives describe problems that are solved by the outcomes listed as positives, on the opposite pole. Problems of working individually are solved by teamwork and the problems caused by teamwork are solved by individual work. If you look at the issue of how to structure work as a problem that you can solve you may find yourself stuck in either/or thinking and the only route becomes to chose one solution over the other. If you choose teamwork over individual work eventually biases will emerge, you may lose good people and you run the risk of group think or herd mentality setting in. Yes, it will be easier to collaborate and align to a common vision or goal but the cost will be high. The solution is to dance between the poles. Breathe in. Breathe out. You can only do that if you identify the issue as a polarity to manage. With the growth of the sharing economy we are seeing new dilemmas arise. Peer-to-peers communities like TaskRabbit, Uber, and NeighborGoods seem to solve problems for many. Airbnb solves the problem of affordable accommodations and offers homeowners a chance to make some extra cash. There are unintended consequences however. It’s effect on affordable housing stock in cities around the world suggests it’s a dilemma that may be best-addressed using polarity management. I suspect the polarities within many of these new sharing services are something like common good/self interest. As city governments scramble to create new regulations I hope they are able to see this as a dilemma to manage rather than a problem to solve. The Johari Window (pronounced JoeHarry) was created by psychologists Joseph Luft and Harry Ingham in 1955 as a tool to help individuals, teams and organizations become more self aware. The idea is that by using the model you would gain a better understanding of yourself, how others saw you and that process could help improve relationships. This model, or tool, works really well in team building and can help reduce the silos that so often keep organizations from growing or succeeding over time. My curiosity is around using it to bridge the gap that often exists between public organizations and their communities. How does the Johari Window work? It’s a pretty simple model that uses the metaphor of opening the panes of the window. In the original model participants were provided with a list of 56 adjectives (ex. able, logical, quiet, responsive, etc.) and asked to pick 5 or 6 that that they believed described themselves. Then participants would do the same for each other. These adjectives, or describing words, were then added to each person’s window. 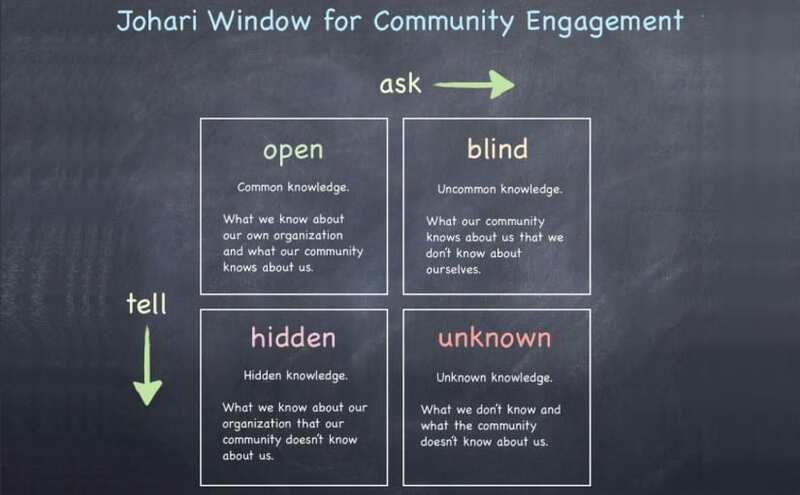 This is my Johari Window that I began while teaching a facilitation skills course many years ago. Notice the lack of entries in the Arena (top left) area. For some context on this, I was teaching a short course and had used the Johari Window to begin a class discussion around feedback and boundaries. It seemed only fair to model what I was teaching so had invited the group to provide me with feedback using this online application. I have also used this in the classroom using a flip chart and post-its, in real time, and without the use of the list of adjectives and have found it works really well – as long as the group is made up of people fairly equal in power. Bias rears its head when the group is mixed and the issues of safety or impression control are at play. In other words, this doesn’t work as well if the “boss” is in the room. The power in the model comes from asking others to provide you with information about how they see you and telling others about yourself. 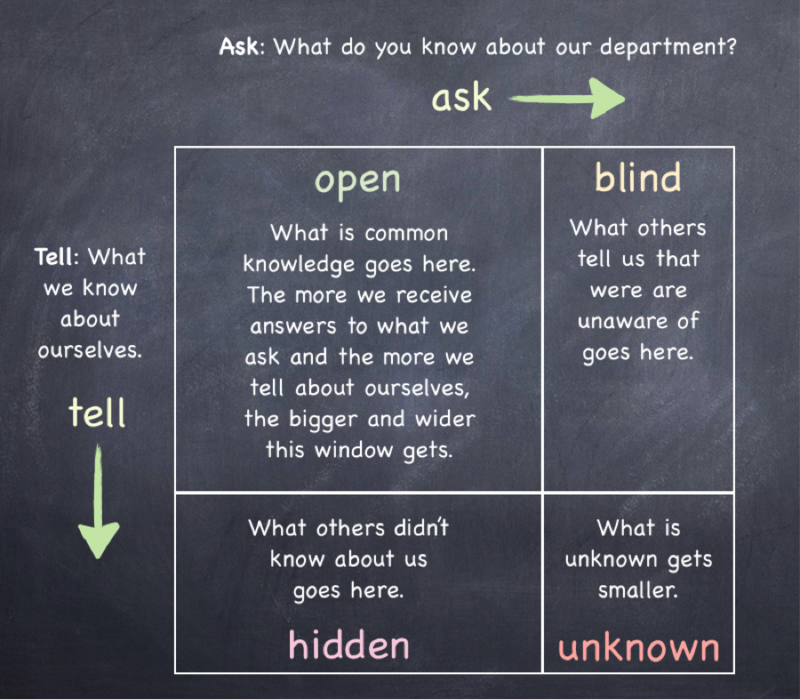 Asking and telling is what opens the window. In team building this kind of process can bring people together by fostering understanding. In organizations this can be used to help departments understand what each does – it’s values, priorities and challenges. There is an affinity, I think, between this model and the Meyers-Briggs Type Indicator. Both offer opportunities to reflect on one’s self and improve relationships with others through mutual understanding. Does the Johari Window scale? At the individual level the Johari Window can help people learning more about themselves and how other people see them. In teams and organization it can add clarity and improve team and interdepartmental relationships. But can it be used by an organization to help form better relationships with community stakeholders? What would that look like and how might that work? What if we asked our community to share what they know or thought about us as an organization? Of course most public and community organizations do that often enough with feedback forms, surveys and the like. I wonder about taking it to the next level by using that information as a basis for deeper learning for both the organization and their community. The more an organization or a community knows about itself, the wiser it becomes. So what are the questions that we can ask community members to get a better idea about what they know about us, that we don’t know? And, how do we compare what the community knows to what we know? How do we open the window? One way might be to send out a survey asking community members to list the words that they would use to describe the organization and to provide an example of why they chose that word. Then send the same question out to the organization members and especially to leadership. The words in common would make up the Open area in the Johari Window. Words from the community not used by the organization would be added to the Blind area and words from the organization not included in the community responses would be the Hidden area. Wouldn’t that be powerful information for any organization and especially for public organizations like schools, districts, municipalities, even non-profits, that want to genuinely engage their community stakeholders? It could provide the basis for a communication plan that targeted what the community didn’t know about the organization. It could also be used to help make meaningful changes in the organization itself. How else might we use the Johari Window? I like tools and models, especially ones that can be adapted to multiple uses. The Johari Window adapts and scales brilliantly so how else might we use this tool? What are your favourite tools or models for learning about your teams, organizations or community? Adapted from original published as Self-Knowledge and Community Engagement by Jamie Billingham August 18, 2012 on Thoughtstream.ca blog. Also posted to LinkedIn.